After the meeting in Santiago, Chile, two brothers stayed there to continue the Pilgrimage of Trust by organising some prayers and small meetings for reflection, in the central region of Chile. 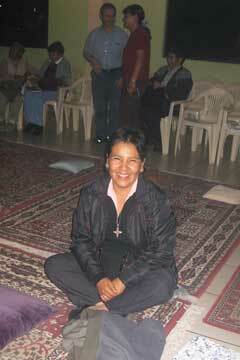 In the same way, since Santiago a brother has travelled as far as Peru, to visit young people who had been to the December meeting. In two of the poorest districts of Lima: Callao and Campoy, there were prayers and times when the young people could share, to talk about what the Pilgrimage of Trust means in their setting, and to reflect on the topics in the ‘Letter from Chile’. The history between Peru and Chile has not always been friendly, but the young Peruvians who took part in the meeting at Santiago spoke of the beautiful welcome they had received, and of the importance of these meetings for living a trust between peoples. The community of Campoy, also known as the Virgin of Evangelisation parish, is a parish belonging to the Diocese of Chósica and is situated in the San Juan de Lurigancho district, to the west of the centre of Lima, capital of Peru. It is the most populated district of South America, and also one of the poorest. The majority of urban developments, human facilities and districts, were generally formed at first by migrants from provinces of the Sierra; which is why one can still find people wearing the dress of the Andes and using their mother tongue, Quechua. The parish began in 2001 and has its centre at the hamlet of “Coteau Le Coq”. The parish includes all the urban area called Campoy; it is formed from 6 communities with their respective chapels. There are plans to enlarge the parish by adding two other communities. The community activities are varied: from a playground for children and teenagers to Family Catechesis; as well as a youth group, Catechesis for children and adults; not forgetting dance workshops, theatre groups, and choirs. In addition, the parish offers social support at the polyclinic of the same name; and finally there is a nursery and a wawa wasi (a day nursery). At the town of Arequipa in the El Tomillo district, at an altitude of two thousand three hundred metres, at the foot of big volcanoes still covered in snow, a parish is the centre where the whole of a poor district finds a welcome and all sorts of help: a dining room for children and old people; a clinic; social, legal and psychological services; a school for children aged 6 months to 6 years (whose single mothers work during the day). 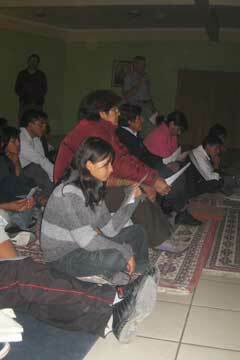 Some of the young people from these communities took part in the meetings at Cochabamba in 2007 and at Santiago in 2010. For them it was a joy to see a brother of Taizé coming to their very own district to spend time with them. For the times of prayer in the afternoon, they had not hesitated to issue a wide invitation to other communities in their towns. 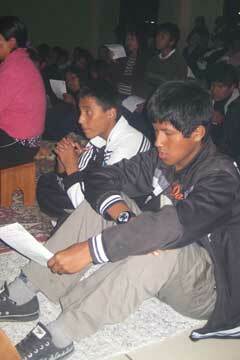 Joyfully, they prepared the songs and a welcoming place for the prayer. 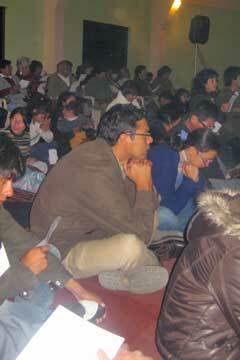 What is impressive about these young Peruvians is the way they live their faith. Thus, amid numerous manifestations of a faith rooted in a culture of popular piety, they seek spaces and new moments for a deeper meeting with Christ.